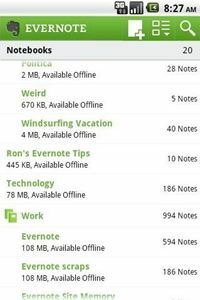 The Evernote is a suite of note-taking application which has been designed to capture and organize notes from computer, phone and the web. To continue its effort in Android platform, Evernote has recently released a new version of Evernote for Android platform. The latest version of Evernote for Android has been improved with several new features and enhancements. Added an additional note browsing view called snippets – designed to be more dynamic, giving most useful information about the note in the smallest amount of space. Added browsing notebook stacks- lets the users visually group their notebooks. Improved editor which allows editing of any note. Improve sync and note viewing and editing performance. Updated access to account info. Automatic disable of background sync after a week of complete inactivity. Fixed image scaling of notes. Fixed settings screen for some languages. The Evernote for Android version 2.6.1 is now available as a free download from Android market. The new Android app works well in Android 1.5 operating systems or above.